Getting glasses for your young child can be bewildering because most parents were unaware that their child even had a problem. However, nearly all children will choose to see well given the right encouragement. We answer the questions you have and give you Tried-and-True tips on how to get your child to wear glasses and keep him or her wearing glasses. How Are Frames Different For Kids? How Are Lenses Different For Kids? How Do I Make 'Em Wear Glasses? How Do I Know my Kid's Glasses Fit Right? How can the doctor tell when my child needs glasses when he or she is so young, anyway? Fortunately, with new technological advances we can see into the eye much more easily, even the eye of a squirmy one year-old. With this new equipment, the doctor is able to shine a light through the lens and see how well it is refracted inside the eye. A healthy, normal-seeing lens will concentrate the light right onto the retina. It's the same idea as when you were young and used a magnifying glass to focus the sun's rays precisely on the sidewalk. If the doctor sees that the focal point is "fuzzy" he will use a series of progressively stronger lenses to sharpen the point of light right onto the retina. The strength of the last lens he uses is the prescription for your child's glasses (See What do all those pluses and minuses on my prescription mean?). It's not as simple as that when your doctor actually does it, though, because he or she has to account for the child's age when correcting the refractive error. What do all those pluses and minuses on my prescription mean? Refractive errors (or the need for glasses) are measured in diopters. + 3.25, means that the focus has been changed by 3.25 diopters. I'm not going to spend time on the technical definition of a diopter right now, if you won't sleep until you know, email me. However, the important thing to notice is that it is positive or negative: -2.50 or +4.75, for example. If the number is negative then your child is nearsighted. If it is plus then he or she is farsighted. This number is called the spherical correction. Imagine an almond turned on its side, that's what your lens looks like. If the almond were a little thicker than normal, then you would be nearsighted, a little bit thinner would be farsighted. A thicker lens bends the light too sharply, falling short of the retina. But a thinner lens concentrates the light to a point that would end up behind the retina. The second set of numbers denotes the correction for astigmatism, also called the cylindrical correction. Imagine cutting a perfectly round orange in half. This is how the perfect lens would look. If you were to squeeze the orange on opposite sides you would be creating an astigmatism between your thumb and finger. If you drew a line between the two sides you are squeezing in, it would be somewhat shorter than the line connecting the other sides. The harder you squeezed, the greater the astigmatism you would be creating (if you squeezed really, really hard, you would be creating...orange juice). The second number essentially says how much those two lines differ. A large number means a greater difference to be corrected. To complicate matters, you could have an astigmatic cornea, lens or retina or any combination of them. If your child has a second set of numbers, then he will have a third set as well, which tells where the astigmatism is located. It is measured in degrees up to 180. On the orange in our example this would tell where your fingers were located. 3 o'clock and nine o'clock that would be 180, at 2 o'clock and 8 would be 145 degrees, Noon and six would be 90 degrees. So how does being nearsighted affect my child? A nearsighted child has difficulty seeing things at a distance, but near objects are no problem. This becomes a very big problem if uncorrected, especially as a child begins school. Since most teachers teach on the chalkboard and practice in a schoolbook, a nearsighted child misses the essential instruction. A farsighted child has difficulty bulging the lens within the eye to see things up close. However, this kind of problem can often go long undetected because a child can bulge the lens long enough to see what you're pointing at before the muscles in his eye get tired. This would allow them to see that tiny speck of paper on the floor, for example, but as soon as he or she picks it up, the tiny muscles controlling the lens will relax and everything will go fuzzy again. Often children with this problem will develop another symptom, such as a drifting eye or eyes. As the child tires, he will no longer be able to control the eyes to focus and his eyes will drift out of alignment. I'm feeling guilty, my child is in the third grade and needs glasses because she's nearsighted. Why didn't the doctor catch it before? Probably because she wasn't nearsighted before. She only became nearsighted as she grew. Your child's eyeball grows just like the rest of her. 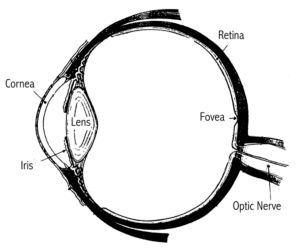 If the lens and eyeball don't grow in proportion, then the focus of the lens slips off the retina slightly. Actually, most children are farsighted when they are young (that's why the doctor corrects to their age, not to 20/20). As they grow their lens and retina can move apart just far enough to make her not need glasses at all! Isn't that cool? Of course, they may grow too far apart and then she will become nearsighted, or not quite far enough away and she'll end up being farsighted. When should I have my new baby's eyes examined? The American Academy Of Ophthalmology recommends that all children with a family history of eye disorders be examined within the first year of life. All other children should have complete eye exams sometime before entering school. The term Lazy Eye is often used to describe an eye that does not hold itself in proper alignment. This eye would drift either outward towards the ear or inward towards the nose. The drifting can be caused by a muscular problem involving the muscles surrounding the eye or an uncorrected refractive error (the need for glasses). If the problem is strictly muscular, then it can be corrected with surgery. If is refractive then it can be corrected with glasses. In many cases it is both.